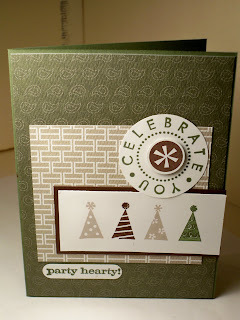 Another Occasions Mini sneak peek and another Stamping 411 sketch challenge here. This one uses With All My Heart and the coordinating Sending Love Specialty DSP. I stamped the circle heart image in Real Red on Very Vanilla card stock. I punched out a piece of the card stock with the Trio Flower punch which exactly fits the papers' flower images. 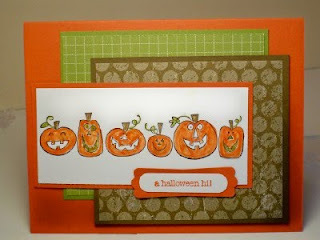 Then I attached the pieces with a Real Red brad and popped that up with Stampin dimensionals. I stamped the sentiment in Real Red and punched out a heart with the Full Heart punch. I also added a piece of 5/8 inch Very Vanilla grosgrain ribbon. Here's a card with some more Occasions Mini products and one I made it for the Splitcoast Sketch #260 here. I used the Vintage Vogue stamp set. I colored the "F" with the So Saffron marker and the "friends" with the Pretty in Pink Marker. The flower border was stamped in Chocolate Chip. I ran the So Saffron background panel thru the Big Shot with the new Perfect Polka Dots textured impressions folder. 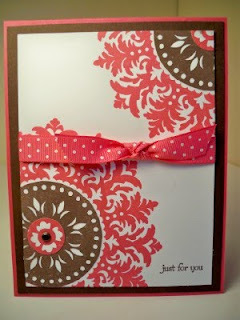 The Chocolate Chip flowered paper and Pretty In Pink polka dot paper are from the Sweet Pea DSP stack. A piece of So Saffron 1/2 inch striped grosgrain ribbon finishes it off. It's my birthday so I'm gonna play at PPA! 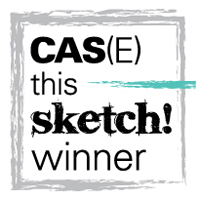 Today's my birthday-29 again!-so I'm playing with my Occasions pre-order and this sketch at PPA. Since I had the Sending Love Specialty DSP out I used that and the With All My Heart set. I used the rock-and-roll technique with the main image. I inked it up in Pretty in Pink then rolled the edges of the stamp in Real Red. I added a Real Red 3/4 inch circle in the middle and finished it off with a Read Red 1/2 inch Sending Love Epoxy brad. The "thank you" is from Teeny Tiny Wishes. Off to play some more! I'm giving you another sneak peek at the Sending Love Specialty DSP from the Occasions Mini available to you on January 5, 2010. I saw this card by Julie Davison and made my own version with the Sending Love Specialty DSP, 5/8 inch Satin Real Red ribbon and the Vintage Labels set from Sale-a-bration. 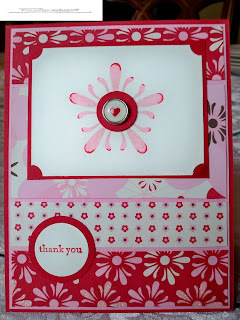 I inked up the small medallion-like stamp in Real Red then punched it out with the Scallop circle punch. I stamped the "for you" sentiment in Chocolate Chip and punched it out with the 1 inch circle punch. The other circle punches used were the 1 3/4 inch, 1 3/8 inch and 1 1/4 inch. I used the Mat pack to pierce holes in the bottom of the Kraft card stock and tied the Satin ribbon around the bottom. Merry Christmas to all! Hope you're all enjoying the day with family and friends. We're having our family Christmas this morning and heading to Kenosha with the rest of the family in the afternoon. We're thankful for everyone and everything we have! 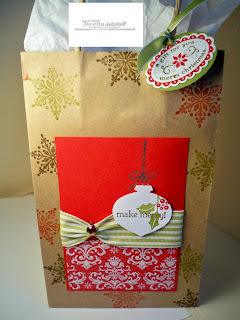 I'm sharing my last Christmas project for this year, a gift bag for my mom's presents. I was inspired by this card that I saw on Splitcoast. The kraft bag was stamped with the snowflake from Patterned Pines in Real Red, Old Olive and Soft Suede. The panel has a piece of the flocked specialty paper from Christmas Cocoa. There's a piece of the 1 1/4 inch Old Olive striped grosgrain ribbon that's wrapped up with a Circle Fire brad. I punched a piece of Whisper White with the Ornament punch. I stamped the leaf from Berry Christmas in Old Olive, the berries in Real Red, and "make merry" in Soft Suede. That's popped up with Stampin' dimensionals. The ribbon stamp was stamped in Versamark then embossed with Silver embossing powder. The tag is from Christmas Punch, layered on a piece of Old Olive punched from the Wide Oval punch. We'll it's Christmas Eve and we're off to Illinois. I thought I'd share this box I made for my sister's Christmas present. It's perfect to dress up a gift card or two. See this post for a link on how to make the box. I used Real Red card stock for the base and some papers and stickers from the Christmas Jingle SS kit. 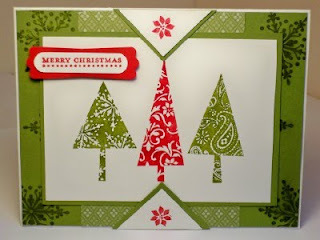 I stamped the trees from Patterned Pines in Old Olive then cut them out and used Stampin' dimensionals on the middle one. The ribbon is Sleigh Bells from the Holiday Mini. I used the small swirl/flower stamp from Patterned Pines to make the tag that I punched out with the Small Tag punch. 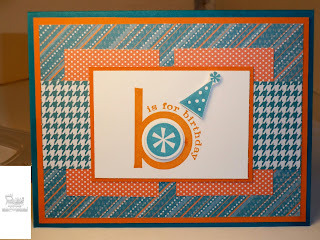 Here's another birthday card with a sneek peek at some Specialty Papers in the Occasions Mini. 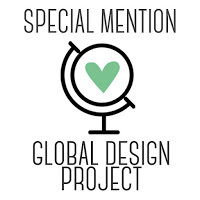 They're called Sending Love Specialty DSP and I do love them! I also used a new stamp set, With All My Heart, that coordinates with the papers. And new Corduroy Buttons in Real Red! I followed the MOJO Monday #118 sketch here. I also used On Your Birthday for the greeting. The border is scalloped with the Scallop Edge punch. The other punches used were the 1 1/4 inch and 1 3/8 inch circle punches, and the Large Oval and Scallop Oval punches. Finally, the ribbon is the 3/4 inch polka-dot grosgrain ribbon, on the reverse side. This one is for the Stamping 411 sketch #130 here. I have a card order for birthday cards so here's another one. Party Hearty is my "go to" birthday set. I think I need to buy another one! And the Specialty papers from To the Nines are perfect for those masculine cards. Here's another Sneak Peek at some Sweet Pea DSP stack papers. And this one is for the Splitcoast Sketch #259 here. I used the Party Hearty stamp set for this gender neutral birthday card. You're gonna love this Paper Stack with 48 sheets of double sided, coordinated papers! Keeping it short and sweet-presents to wrap and cookies to bake yet! 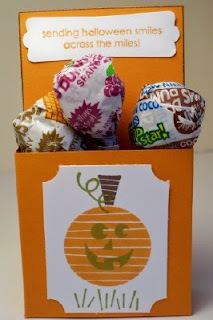 Here's another sneak peek from the Occasions Mini and the Sale-a-bration sets. I made this gift bag and card for a bridal shower that I'm attending on Sunday. I took inspiration from the bride's bath towel color on her registry. It's closest to Sage Shadow so I used that with Chocolate Chip and Rich Razzleberry. The new sets I used are Vintage Vogue (Occasions Mini) and Vintage Labels (Sale-a-bration). The flowers from Vintage Vogue were stamped in the three colors and the sentiment, "Life happens. Love helps" was stamped in Razzleberry. 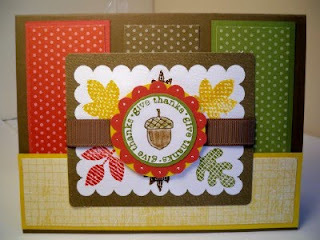 The oval image from Vintage Labels was stamped in Razzleberry and the "Best Wishes" stamped in Chocolate Chip. 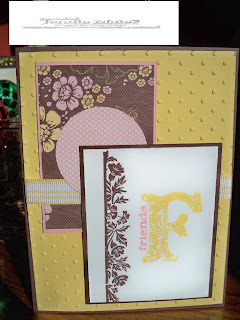 The card uses a stamp from Fun and Fast Notes and the Backgrounds 1 texturz plates. I colored the image with blender pens and added a bit of the 1/2 inch Rich Razzleberry polka-dot grosgrain ribbon. 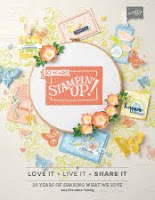 You're getting a look at some new Designer Papers in the Occasions Mini Catalog out January 5, 2010! There's an awesome Designer Series Paper Stack with 48 sheets total of double sided, really cute papers. 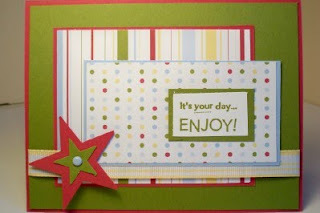 Now that my Christmas cards are done and sent out, I hope to play more with my Occasions pre-order! I made this for the Mojo sketch #117 here. Party Hearty is the set I used. I first stamped the whole cupcake image in Rose Red, stamped the frosting part in Chocolate Chip on scrap paper then cut it out. I also stamped the candle in Tempting Turquoise and cut that out. 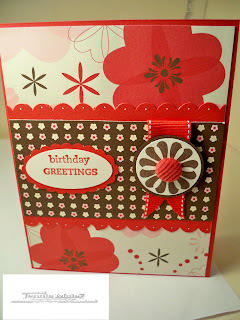 The Scallop Circle #2 Bigz die was used for the Rose Red circle and the Coluzzle was used for the Whisper White circle. The "cake" sentiment was stamped in Chocolate Chip on Rose Red paper then punched out with the Word Window punch. A border with Tempting Turquoise was made with the Scallop Edge punch. A bit of 1/4 inch Tempting Turquoise ribbon and it's done! It's been a bad weekend around here! My daughter Abby had her two front teeth knocked out of place during her basketball game. Luckily we were able to get our dentist to put them back and now we're working with the ortho. All after getting her braces off this summer. A bit of prayers will hopefully help them heal! She's been such a tough cookie! Meanwhile, I've gotten a couple of card orders so I need to make an anniversary card and the Stamping 411 sketch #129 was perfect! I used the retired Candy Lane DSP, the Always stamp set and Teeny Tiny Wishes. I punched the Pink Pirouette piece of dsp with the scallop edge punch. 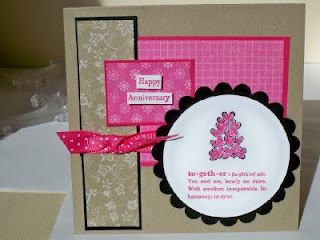 Happy Anniversary was stamped in Close to Cocoa, punched out with the Small Oval punch then layered with the Scallop Oval punch. The ribbon is Riding Hood Red taffeta that is also retired. The big heart is from Always and the rounder one was punched with the Heart punch. It's a gift card kind of Christmas so I wanted to have a little something special to give them in. I make these pizza boxes using the Christmas Jingle SSK. 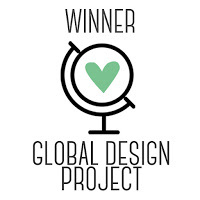 I found the template here on Jen del Muro's blog. They are so cute and easy! The papers, snowflake stickers and Old Olive scallop circle sticker are all from the Christmas Jingle SSK. I used the Ticket Corner punch on the corners of the papers. I colored the "Holly Jolly" stamp from the Christmas Punch set with Chocolate Chip, Real Red and Old Olive Stampin' write markers. The "Make Merry" is from Berry Christmas and the little flower image is from Season of Joy. The ribbon is from the Sleigh Bells set in the Holiday Mini. I used my Crop-a-dile to punch the hole thru the chipboard circles and tied them on with Gold elastic cord. I'm chipping down to the last of the Chrismas cards I need. I did this one for the MojoMonday Sketch #116 here. 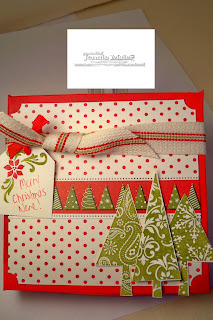 I used the Christmas Jingle Simply Scrappin' kit papers and self-adhesive die cuts. I also used a piece from the Old Olive Patterns DSP. I cut the circles with my Coluzzle. In the center of the red circle I stamped the snowflake from Berry Christmas in Old Olive and added a Circle Fire Rhinestone brad. The ribbon is a piece of the Misletoe ribbon from the Holiday Mini. Finally, Merry Christmas from Teeny Tiny Wishes was stamped in Old Olive then punched with the Word Window Punch. Obviously I can't stop using the Delightful Decorations set! 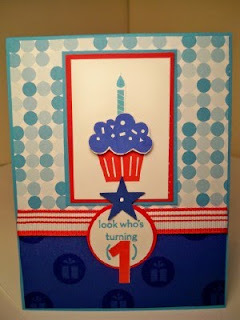 I made this card for the Stamping 411 challenge here. I punched out a piece of the red flocked paper from the Christmas Cocoa Specialty papers with the Ornament punch. I stamped the ribbon from Berry Christmas in Real Red. And the joy ornament was stamped in Old Olive. 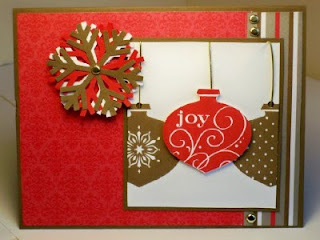 The Real Red Stampin write marker was used to create the other ornament hangers. Finally, I stamped Merry Christmas in Real Red. A piece of 3/4 inch Real Red polka-dot grosgrain ribbon finished the design. 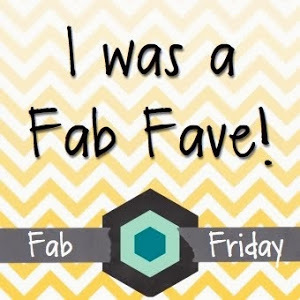 I'm on a roll-another post today to make up for last week! Here's another Christmas card done for the Splitcoast Sketch Challenge #257 here. I just love the Delightful Decorations set from the Holiday Mini! And the coordinating punch makes for fast cards. I masked the Soft Suede ornament then stamped the two other ornaments in Real Red. I'm really trying not to hoard my papers and to use up the Christmas Cocoa Specialty Papers. My back is finally feeling better so I'm trying to fininsh making my Christmas cards. So I made this one to catch up on last week's Mojo Monday #115 sketch here and PPA#19's Inspiration Challenge here. I immediately thought of the leaf stamp in the Berry Christmas set. I stamped the top of that in a circle with Old Olive, added the berries in Real Red and the little poinsettia stamp is from Season of Joy, stamped in Soft Suede. The greeting from Teeny Tiny Wishes is framed in a sticker from the Christmas Jingle Simply Scrappin kit. I ran half of the Old Olive base thru the Big Shot with the Petals-a-Plenty impressions folder and added some Sleigh Bells ribbon. I had time to play this morning so I made this for the Stamping 411 sketch here. I'm not going to hoard paper anymore so you might be seeing a lot of the Christmas Cocoa Specialty papers. 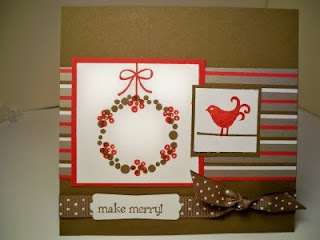 I used the Berry Christmas stamp set, the Jumbo Snowflake punch and some Mistletoe ribbon. The greeting was stamped in Soft Suede and punched out with the Modern Label punch. Can you believe it's actually December? I've been m.i.a. for a few reasons. It was a nice Thanksgiving weekend with family. And then I threw out my back starting to decorate for Christmas. Today was the first day I could sit to stamp a little. So I caught up with the Splitcoast sketch #256 here. This was a quick card cuz, again, I just traced the dimensions on a piece from the Christmas Cocoa Specialty papers. And only one thing stamped was the greeting. It's hard to see, but I ran the Soft Suede piece thru the Big Shot with the small polka dots from the Backgrounds 1 texturz plates. The circle is punched with the 1 3/8 inch circle punch and the snowflake with the Jumbo snowflake punch. An Antique brass brad adheres the snowflakes to the card. 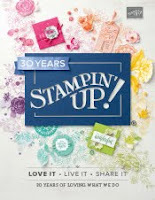 Come check out the huge sale at Stampin UP! 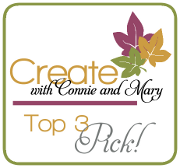 Now thru Nov 30th there are many products 30, 40, even 50% off. 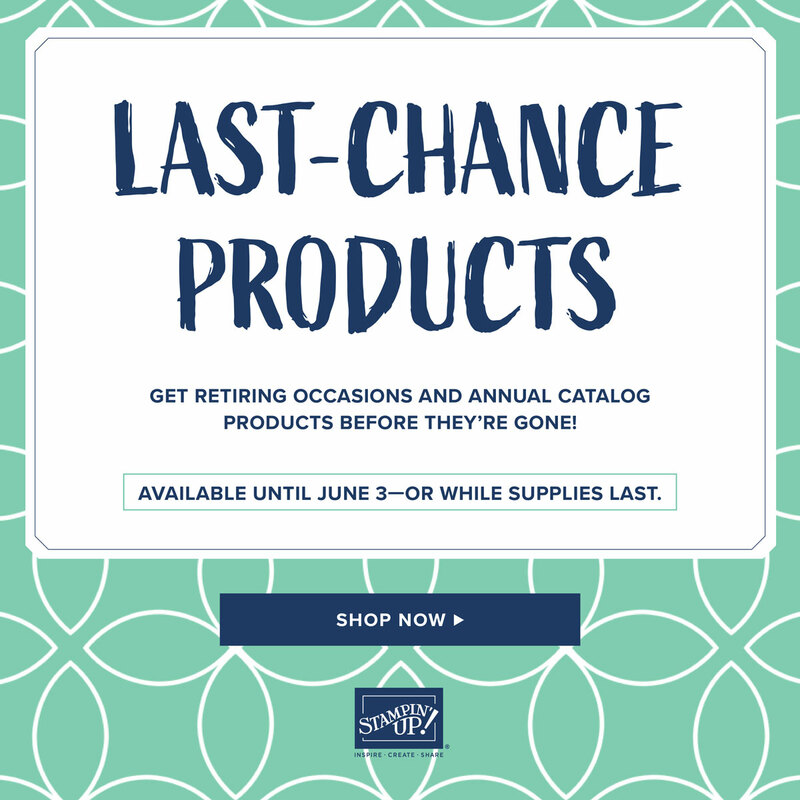 Lots of great bundles too. Go shopping from the comfort of your home. Click here to go to my online website. Happy Thanksgiving and Happy Shopping too! This thank you is for Megan's birthday presents and the MojoMonday sketch #114 here. This was a quick and cute sketch. I used the big flower image from Enjoy Every Moment then layered the smaller flower image in the middle circle. A Rose Red brad fits nicely in the center. The papers are from the Thoroughly Modern DSP. The piece of Rose Red and Soft Suede were run thru the Scallop Edge punch. A piece of Kraft taffeta ribbon finishes off the card. 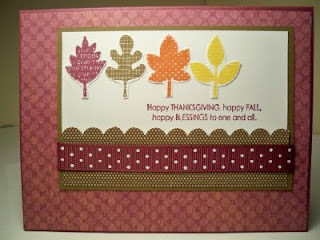 I made my last Thanksgiving card using the Stamping 411 sketch challenge here. I used the Falling Leaves stamp set with the colors Crushed Curry, Rich Razzleberry and Soft Suede. The Soft Suede dotted paper is from The Write Stuff Specialty papers. And the Crushed Curry and Rich Razzleberry papers are both from the Razzleberry Lemonade DSP. I used my Coluzzle to cut out the circle, wrapped some Crushed Curry 1/2 inch polka-dot grosgrain ribbon around the front and popped up the sentiment with some Stampin' dimensionals. This one is for the MOJO#113 sketch challenge here. It's also for a Color Combo over at Splitcoast, CC245, Always Real Chocolate here. I used markers to ink up the tree image from Season of Joy. Real Red is on the star, Always Artichoke on the tree and Chocolate Chip on the trunk. There's a strip of Real Red from the Christmas Cocoa Specialty papers and a square of Always Artichoke from To the Nines Specialty Papers. 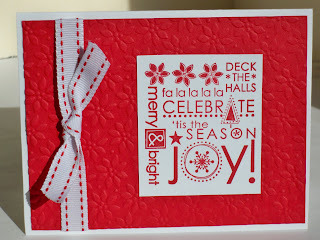 The snowflake is also from Season of Joy, inked up with the Red and Artichoke markers. A tiny Circle Ice Rhinestone brad is in the center of the snowflake. And the ribbon is from the Mistletoe ribbon in the Holiday Mini. This birthday card & present are for my oldest daughter, Megan. Today is her 15th birthday. She's a beautiful, funny, bright, caring, loving and talented young lady and we're grateful she's in our lives! I was inspired by the wrapping paper for the colors and this PPA#17 sketch here. The present image from Holiday Blitz fits perfectly in the 1 1/4 inch square punch. Then I layered that with the 1 3/8 inch square punch. I used the Happy Birthday image from Teeny Tiny Wishes. The Close to Cocoa flowers are punched out with the Trio Flower punch and a I added a dot with the white gel pen. Some 1/4 inch whisper white grosgrain ribbon is tied around the Close to Cocoa Prints DSP(now on the Clearance Rack for $3.99). Finally, a designer brad from the flower assortment and two buttons from the Sherbet Designer Buttons finish it off. I'm just playing catch up this week. Crazy weekend with girls' club volleyball tryouts and two of the three kids having off for two days. And now the third kid has off the other three days of the week. Anyways, I made this card for the Stamping 411 sketch here. I haven't used the Cottage Wall DSP lately so I pulled out that and the For All You Do Stamp set. I stamped the square flower image with Rich Razzleberry and used the sentiment from Garden Greetings(on the dormant list). I used the Ticket Corner punch on the corners of the white square and added a gold brad. A little ribbon and it's done. Now that it's Saturday, I'm finally getting to the MojoMonday sketch #112 here. 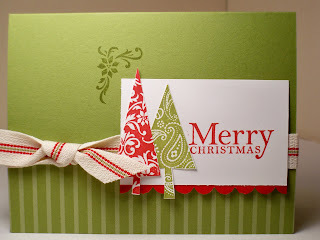 I'm using the Christmas Cocoa Specialty papers again with the Berry Christmas stamp set. I stamped off the poinsettia image once with Real Red ink then stamped it again, just moving the image to create a little fuller look. That's easily punched out with the 1 3/8 inch circle punch then layered onto the scallop circle punch. 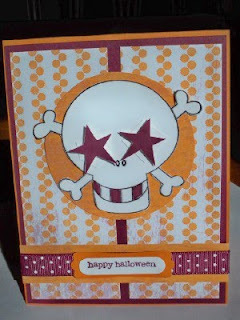 I popped that up with a few Stampin' dimensionals. I also used the 1 3/8 inch punch for the Soft Suede circle but just folded that in half. My Crop-a-dile punched the hole thru the three layers of card stock with ease. A little Mistletoe ribbon and it's done! I "made merry" for the Splitcoast Sketch #254 here. I know I'm a broken record here but I just love these sketches because it's too easy to trace the exact measurements onto card stock then create a quick and easy card! 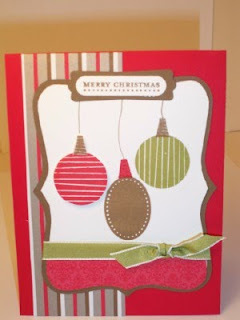 I used some Old Olive Patterns Paper and some Christmas Cocoa Specialty paper with the Berry Christmas stamp set. I broke up the sentiment and used the Stamp-a-ma-jig for that and to put the bird in the wreath. This one is for the PPA#16 Theme Challege: Christmas Cheer here. If this looks familiar it's because I CASEed it from the Holiday Mini on page 4. I did change it up a bit. 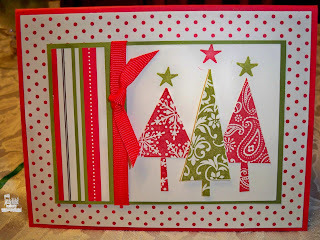 I stamped one tree in Real Red and the other in Old Olive on Whisper White card stock then cut them out. I added a Real Red strip that was punched with the scallop edge punch. And the sentiment is from All Holidays. I'm loving the Sleigh Bells ribbon! I'm just catching up today after a crazy but fun weekend. My daughter, Abby's 8th grade A volleyball team won 3rd place in the Seton volleyball tourney. Even better, Abby earned three sportsmanship awards from three different teams. Needless to say, we're sooo proud of her! Back to the card info. I made this for the Stamping 411 sketch challenge here. 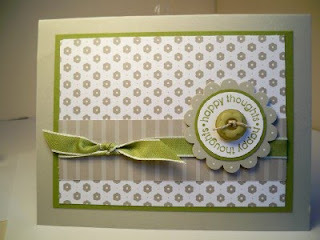 I ran the Old Olive card base thru the Big Shot with the Petals-a-plenty textured impressions folder. I used a strip of Razzleberry Lemonade dsp and a piece of 1 1/4 inch Old Olive striped grosgrain ribbon. 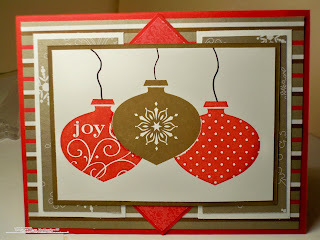 Finally, I used the Old Olive and Rich Razzleberry markers to color the stamp from Season of Joy. This was a really fast and easy card to make! I just let the Christmas Cocoa Specialty paper do all the work. I cut a piece of the flocked snowflake and layered that on a Soft Suede card base. 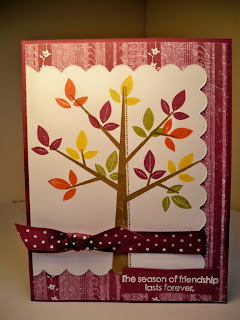 The little snowflake is from the Christmas Punch stamp set and was punched out with the coordinating Boho Blossoms punch. 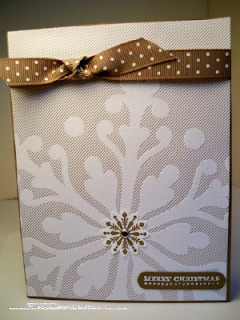 I used white craft ink for the Teeny Tiny Wishes sentiment and embossed that with white embossing powder. A silver brad attaches the snowflake and some ribbon completes the card. Another Christmas card crossed of the list. This one was soooo quick and simple. I just ran a piece of Real Red card stock thru the Big Shot with the Petals-a-Plenty textured impressions folder. Then I stamped the image from Season of Joy, attached some ribbon and tied a bow and I was done. How easy is that? Here's one for the PPA#15 color combination here. The colors are Ruby Red, Taken with Teal and Basic Gray. I thought of these colors and thought they'd make a good masculine card. So I used the Circle Circus and Teeny Tiny Wishes sets. I also ran the Basic Gray thru the Big Shot with the diamond patterned Backgrounds 1 texturz plates. 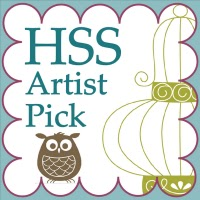 The strip of Ruby Red is from the Hostess Patterns Pack DSP III. I made this Christmas card for the Splitcoast Sketch #253 here. I just flipped the sketch on it's side because I thought of the trees from the Patterned Pines set. I used the snowflake stamp from the set too. And I colored the little poinsettia with the Real Red marker for the triangle flaps. The sentiment is from Teeny Tiny Wishes. I made this card to use up some of the Patterns Pack DSP. And I think it qualifies for today's color combo over at Splitcoast here. The challenge is supposed to be Neutrals with a POP! So my neutral is Sahara Sand and the color pop is Old Olive. It's pretty cute if I do say so myself! 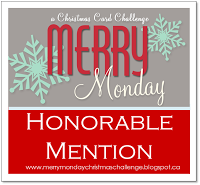 Another MojoMonday sketch here and another Christmas card checked off my list. I used the Delightful Decorations set, the Ornament punch and the new Jumbo Snowflake punch. A little elastic gold cord and gold brads for some bling and this one is done. 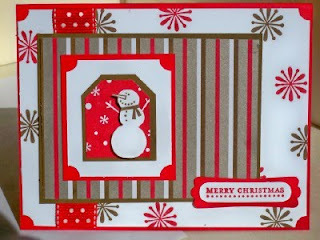 I layered the snowflakes and secured them with a gold brad then popped them up with Stampin' dimesionals. This one's for the Stamping 411 Sketch challenge here. I immediately thought of the leaves from the Falling Leaves set when I saw this sketch. I used some Razzleberry Lemonade DSP for the main paper and the Soft Suede DSP is from the Thoroughly Modern DSP. And as usual, I added some ribbon too.I enjoyed an afternoon of stamping some more Thanksgiving and Christmas cards-looking forward to sharing some in the future!